Hello, Good day importer exporter, Lol... 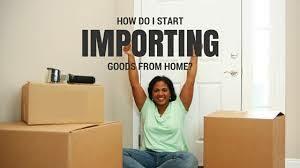 Welcome to this brief article on importation business in Nigeria. And yes, after reading this and taking action you'll officially be an importer in Nigeria. It doesn't matter what you exactly wanted by reading this, because I know this article will solve all your importation business questions. Thank you for reading this life changing online importation article. This tutorial will teach and guide you on how to start importing cheap goods from USA, UK and China at a cheaper price. I will advise you purchase The 5K Importation Bible Package HERE For more understanding before taking an action. You can also print ebooks out after purchase for better access. Importation business requirements: To successfully start this importation business, you need to make these materials available first. If you have a laptop or phone, you can make use of it and it will make it easier for you. But if you don’t have a laptop or a good browsing phone, you can make use of cybercafé pending the time you will get your own computer. There are certain things you have to consider Before going into importation business. You must know what the people in your environment want. It would not be nice if you start importation business without knowing what the people in your locality would like to buy. For instance, if you are a student and you stay in the campus, you should know that your fellow students will surely like things like new/used laptops, phones, memory cards and game consoles. If you go and import a car as a student, it would be difficult to see a fellow student that will be interested in that. I hope you understand what I mean? Be sure that whatever you want to import will be of interest to the people in your locality, especially when you are starting small. Before I starting importing from the US, I Discovered in my area that people where crazy about smart phones, especially Blackberry. What I did was to import a lot of used blackberry smart phones at a cheaper rate and sold it to them at an affordable price. Gradually I started getting referrals because I was Selling very high quality stuff from the US. Now this discourages a lot of investors but I'll be revealing how to beat the high dollar rate and buy at very very cheap rates without stress. 17. Apple products like iphone, ipad, ipod, Macbook, etc. 38. Home Accessories: like washing machine. You can import virtually everything that is sold in the Nigerian Market from the US and China and UK at a cheap rate and sell them here at an affordable price. There are alot of website online which claims that they are selling cheap goods but you will find out that they are pure scam. I will be revealing the real one's that I have used for you here. The above websites are the ones am currently using to make purchases online and I will explain 3 out of them to you. Though the procedure for registering on the remaining website are almost the same. I will take you through the process on how to make use of this portal and the one that am going to use as an example are 1688, ALIEXPRESS, DHGATE, AMAZON and EBAY E.T.C. The first thing you need to do is to open an account with the shopping sites, After which you to make a purchase. Now before doing that, CLICK on "continue reading" below to get the 5K importation manual which contains all the above tutorial. Discount Offer Ends in a short while (Ends 10th January 2019) so click the Continue reading link above to get the 5K IMPORTERS blueprint. Keep reading and sharing articles on this blog let's build income streams together.